The completion date for the new Delaware County courthouse has been delayed by a month, according to Facilities Director Jon Melvin. He told county commissioners Thursday that the date has been changed from July 31 to Aug. 31. Work continues at the new building located on North Sandusky Street. The completion date for Delaware County’s new courthouse has once again been pushed back. Officials said Thursday that the date has been delayed from July 31 to Aug. 31. The original completion date for the courthouse was June 30 of this year. 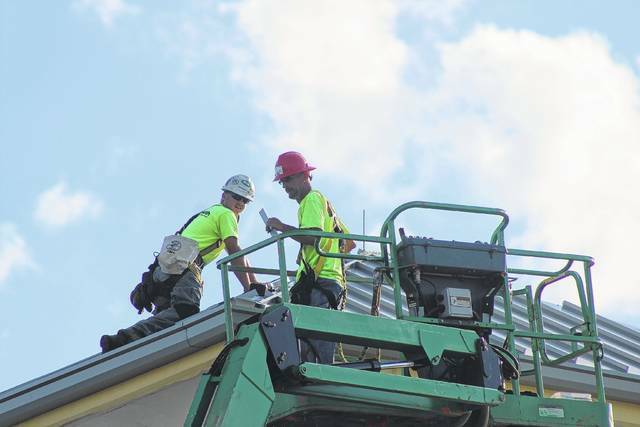 “Currently, they are working on a July 31 substantial completion for the majority of the building,” Facilities Director Jon Melvin told county commissioners on Thursday morning. He said the construction management company, Lendlease, is concerned about the status of work on the courtrooms on the fifth floor of the new building. “They’re anticipating not having that completed until the end of August,” Melvin said. Melvin presented a 15-item list of changes to the construction of the courthouse for commissioners to approve during the meeting. “The net increase in the changes is $31,400,” he said. Commissioners signed off on the changes. County Administrator Ferzan Ahmed said the construction costs are still $200,000 below the guaranteed maximum price of $39.3 million. Current construction costs have reached $39.1 million for the project that started in the fall of 2015. Ahmed said there are two things that are not being sacrificed, the guaranteed maximum price and the quality of work. Ahmed said until the fifth floor of the new courthouse is completed the county can’t move into the building. He said the move wouldn’t be possible until September. Melvin said there are more than 250 pages of detailed drawings related to the construction of the courthouse. He said he attributes some of the delay to omitted details in the design and the associated coordination issues due to the change in the work. He said the changes varied from adjustments in the courtrooms that were requested by the judges, mechanical issues, details in the drawings, and some value-added changes. https://www.delgazette.com/wp-content/uploads/sites/40/2017/06/web1_COURTS-BUILDING.jpgThe completion date for the new Delaware County courthouse has been delayed by a month, according to Facilities Director Jon Melvin. He told county commissioners Thursday that the date has been changed from July 31 to Aug. 31. Work continues at the new building located on North Sandusky Street. This entry was tagged Courthouse, delaware county, Melvin. Bookmark the permalink.